colors to depict this color-saturated work, producing beautiful eye-catching colors. By using warm colors, Sisley added radiance and beauty with the bright golden yellow to the whole painting, showing the quiet and peace of traditional activities of countryside. In this painting, vivid collision is made by different colors and brush strokes. 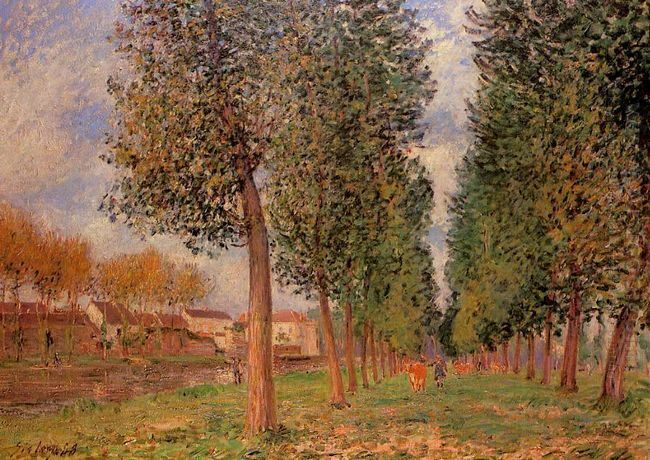 Throughout Sisley’s life, he devoted his time to the creation of landscape paintings, producing some 900 oil paintings, some 100 pastels and many other drawings that strongly invoke atmosphere. His artworks are described as “almost a generic character, an impersonal textbook idea of a perfect Impressionist painting” by art historian Robert Rosenblum. called “the most beautiful painting in Russia”. In this seascape painting, Aivazovsky depicted a scenary of people in a ship facing and defeating the nine waves after a night storm, trying to survive from death by clinging to debris from a wrecked ship, showing their strong will and dogged perseverance to fight against storm. Aivazovsky described a group of people attempting to save their lives from the merciless storm and oceanic waves. The sun illuminating a strange, oneiric range of green and pink shades on the scene is faintly visible behind the clouds which occupy the whole sky. The roaring waves in multiple layers agitated by the wind seem to swallow this lonely struggling ship. Though Aivazovsky painted this painting light dark-hued, we can still see a few rays of golden sunbeam behind a thick layer of dark clouds, the sun is going to disperse dark clouds and stop the storm, giving people a glimpse of hope and a way out of the difficult position is suddenly visible. 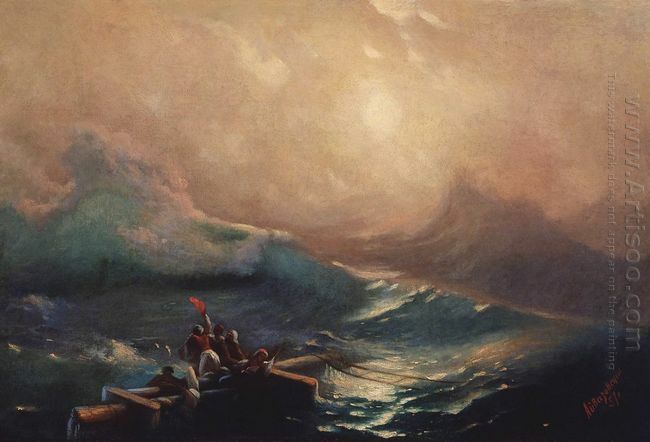 In this painting, Aivazovsky reached an absolute technical perfection, his depiction of the storm, the struggling people and the roaring waves in a vivid way shows his excellent technique and superb skill for painting. 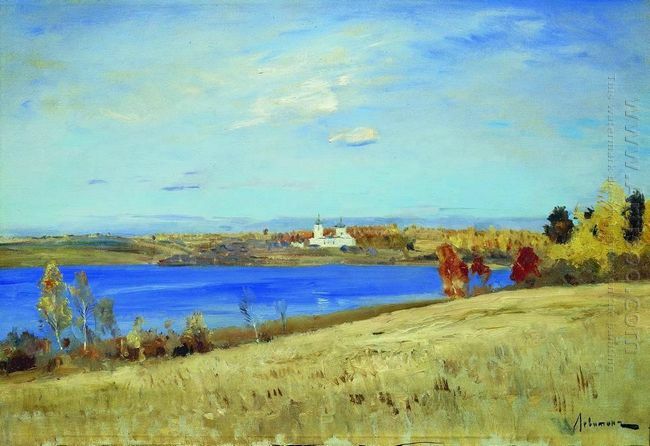 Golden Autumn, an outstanding lyric paintings created by Issac Levitan in 1895, a well-recognized unsurpassed Russia-based master who had never painted a piece of urban landscape in his life time, instead, he preferred the forest or modest countryside landscape full of poetic conception. He delivered the idea of the Russian lyrical landscape incisively and vividly in his paintings, making him loved and admired by people, especially Russian people. In this Isaac Levitan painting, we can see a calm crystal clean it gorgeous and shining. Autumn, as a as a procedure of nature turning life to death, it’s a bleak and desolate season. However, Levitan showed a contrary aspect of autumn to people. Rather than labeling autumn in this realism painting as a withering season, it allows viewers to feel the vigor and vitality of autumn. Every aspect of this color-saturated masterpiece seems to be in vitality, golden trees, clean river and blue sky exude smell of warmness and energy, allowing the viewers to get involved in this beautiful scene. 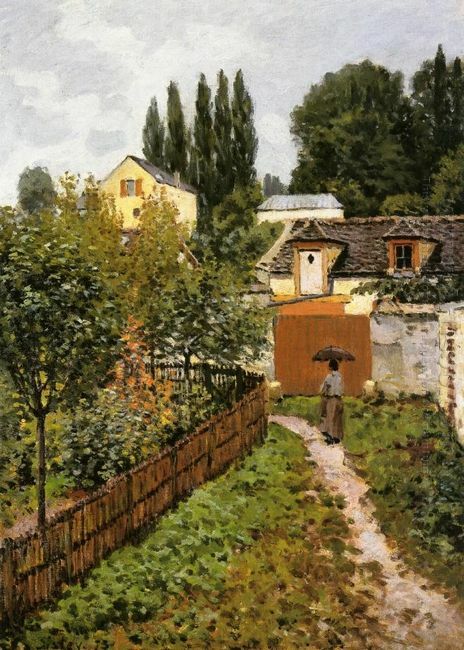 Alfred Sisley, one of the principal creators of French Impressionist art, created this painting titled Garden Path in Louveciennes chemin de l etarch. During his life, he painted nearly 900 oil paintings, the landscape paintings constitute most of which, earning him the purest landscape painter among all of the Impressionist artists of that period. In his paintings, the human figures, city views hardly make appearance while countryside subject-matter is his favorites. In this painting, such as title, it describes a scene of a garden path in a village. We can see that on the left side of this painting, green trees were seperated from the path by fence. There are houses standing on the right side, and dense forest in far distance. A women holding a black umbrella is walking on the path. It’s a cloudy day with dark and grey sky decorated by floated clouds Sisley painted. It’s a bare road but accompanied by lush and green grass on both sides. The whole scene reveals an atmosphere of tranquility and peace. Alfred Sisley’s landscape paintings occupy an irreplaceable place in the history of early Impressionism. He is famous but not known, admired but little studied. 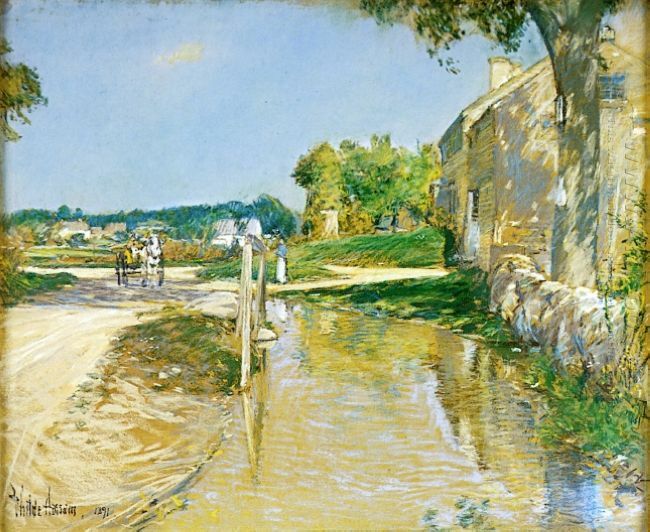 For most of his life, Sisley devoted himself to painting traditional countryside and rural scene, focusing on undisturbed or only distantly animated aspects of his surroundings. He has the capability of turning those scenes to paintings vividly. It is obvious that he showed no interest to aspects of urban life. 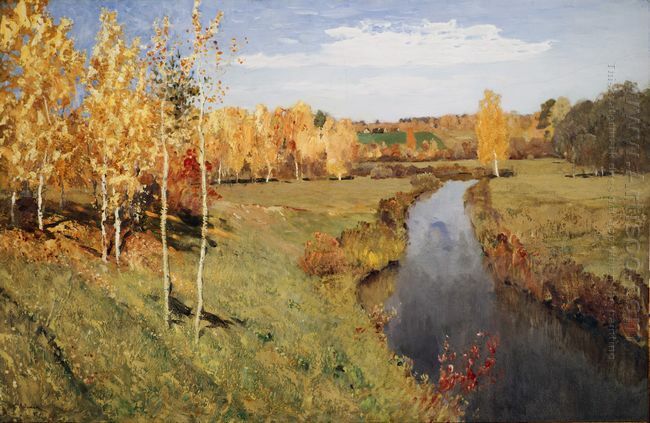 This landscape painting entitled Autumn River is created by Issac Levitan in 1899, depicting a scenary of a sunny day in autumn. Levitan, a Russian painter, devoted his entire life time to art creation which is the most important thing and meaning of existence to him. Though in his painting career, he was tied to endless doubts, torments and self-dissatisfaction, he still owned faith in his own ability, yielding a series of meditative, thought-provoking landscape paintings with a spiritual dimension. Isaac Levitan implemented bright color palette to render warm and delighted scene with delicate technique and superb skill. He represented and transformed the commonplace, finding beauty in blue river, vigor in dense grass land, giving the ordinary scenary with new meaning. We can see a broad rich mass of grass which seem to turn yellow in a short time because of autumn. The bright blue river is calm and quiet with no waves and ripples, surrounded by the grass land. White houses standing in far distance can be seen clearly. Though the sky is covered by white walking clouds, its blue color can still be faintly visible. The long slender bars of cloud float like fishes in the sea of blue light, involving viewers in endless imagination in this painting. Levitan always found inspiration for his landscape paintings arousing resonance of their viewers from serenity and tranquility of rural life in Russia. He painted vivid paintings to allow the viewers to encounter something real in his paintings, creating a truly immersive experience. This painting titled Autumn Day Sokolniki created by Isaac Levitan whose artworks became influential in the broadest sense of the word, having a great effect on the development of landscape painting. Such as the title, it depicts an autumn landscape in Russia. Levitan always found his subject-matter in the ruralarea, in the fields, forests and meadows. 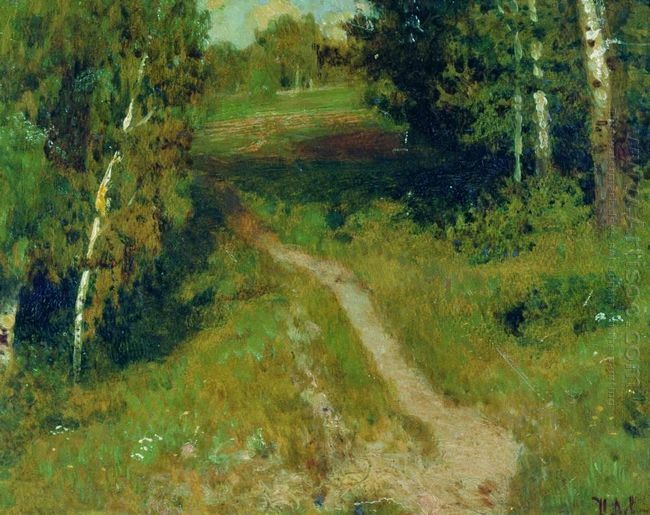 It’s Levitan’s first artwork as well as the only work that human being makes appearance, after that, Levitan only painted natural scene such as forest, houses, lake, sky and so on. 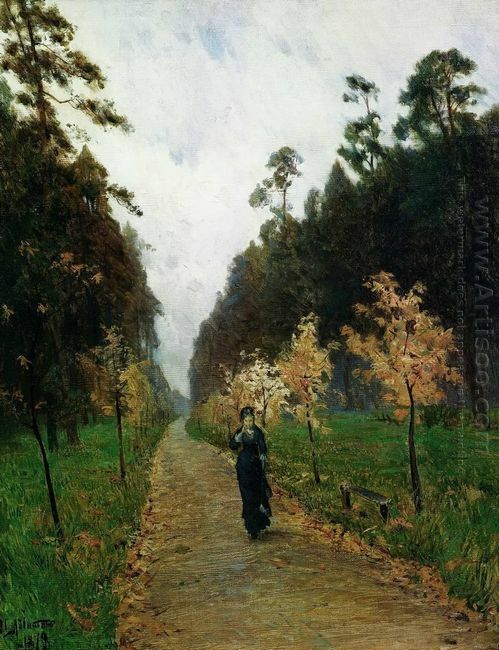 In this painting, we can see a woman in black walking alone in the path of Sokolniki which is filled with yellow fallen leaves. Her suits match that season and weather perfectly, delivering an atmosphere of desolate and lonely just as the impression this season leaves on us. From the painting, we can’t see the start of this road which is accompanied by dense forest. Some trees have already turned golden yellow with some leaves remained, while the rest still stay green. The grass on the both sides of road is in bright green. Grey and dusty painted on the sky. Though there are not any characters appear in Levitan paintings after Autumn Day Sokolniki, the realm of nature can’t be separated from the realm of human feelings in his paintings. Just as what this painting expresses, the dusty sky filled with grey clouds, the falling leaves from yellow trees, the empty road, all these desolate elements reveal this woman’s inner feelings vividly. Issac Levitan created this realism painting, Birch Grove in 1889. Birch is always one of Levitan’s favorite subject matter among those countryside elements, forest, sky, lake and so on. He attempted to explore and represent the serenity and peace of rural life while eschewed the hustle and bustle of “cityscape”. That’s why there are no traces of city scene in any of his paintings. A first glimpse of this painting makes viewers feel they are walking into a paradise as a fairyland which you are unwilling to leave. The whole scene is bathed in golden shining sunshine, creating a bright and vigorous sight. Birch tree trunks stand erect in the grass land. The sunshine sifts through the sparse green leaves, pouring a sea of dappled sunlight on the grass land. The mottled shadow of sunlight on the grass makes this painting as a real scene, involving people in this gorgeous wonderland. The dense grass unfurls, bathed in a gentle light. Small white and purple flowers are dispersed here and there, decorating the grass and adding color and vigor to this landscape. Levitan represented a beautiful scenary of Russia vividly by this painting. He owns the capability to strike a responsive chord in the hearts of not only Russian people but people from around the world by the means of landscape paintings that are kept faithful to simple poetic motifs of his native land. In their paintings, you’ll be immersed in the tranquility, meditation, hope for life and the beautiful landscape these paintings bring. Study for Blue Apple Tree Series is one of Piet Mondrian’s abstract paintings, which almost went to the edge of the pure abstract, becoming the symbol of the pattern. It’s exhibited in the “Modern Art Exhibition” held in Amsterdam in October 1912. Mondrian was a great abstract master good at turning the surface of the canvas into a precious artifact in consideration of texture richness, color combinations, and dynamic balancing of the composition, transforming the art of representing reality by means of painting. By transforming the black color branches and trunk into straight lines and arcs, Mondrian simplified the subjects of this artwork down to the most basic elements. He employed warm yellow color as background with light green distributed around the tree to make viewers feel delighted, using colors according to his inner vision rather than the things’ appearance in reality. The branches and trunk are staggered mutually, showing that the figure of a tree is vertical interacting with horizontal. 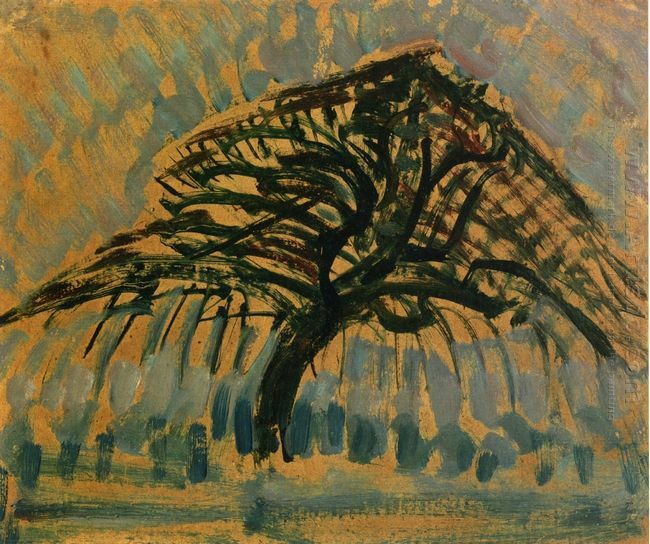 Mondrian represented the tree and his aesthetic style naturally with the abstract color of the tree and the simple design in this painting. Mondrian was always searching for his own unique personality and explored a new sense of unity in the cubist type of space even though under the shadow of Cubism. Mondrian was the real contributor to cubism, rather than the imitator. He was assessed by Apollinaire, “Although Mondrian is strongly influenced by Picasso, Mondrian’s personality is completely owned by himself”. Fishermen at Sea was depicted by Joseph Mallord William Turner who was English romantic landscape painter, famous watercolor painter and printmaking artist. At that time, 21-year-old Turner has minor celebrity for his classical style watercolor topography painting, and popular among collectors. But he considered that to establish his reputation, he must produce more mature oil paintings. In this painting, the fishing boat’s location was Isle of Wight that outside the southern coastline of the British. Turner has been visited the island in 1795 and painted a lot of sketches and watercolors about the coast that included in Sketch of Isle of Wight. However, there were no another sketches exactly correspond to it. Until recently, people think that the rock on the left side was Dells reefs on the western island. Few people know that he had created the painting with high creative skill and quality, but we can see that this was not his first attempt at painting. “Boats floating and flickering on the sea naturally, while the water waving, which created realistic effects.” This honorable reputation was praised by the review guide from Royal Academy of Arts for its naturalism characteristic. 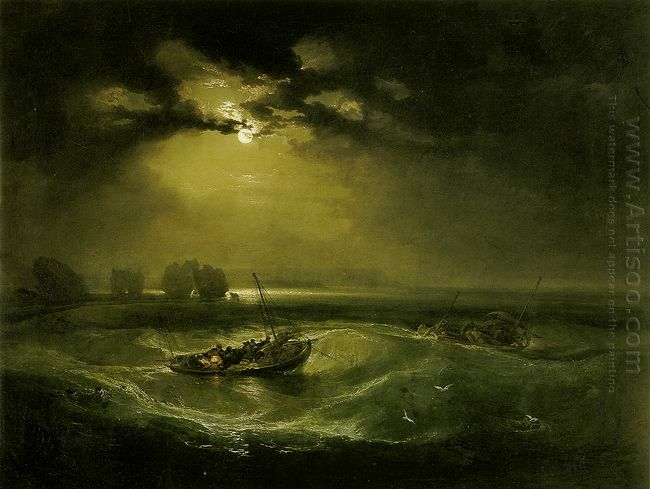 In fact, from the processing technique of light and shadow, and the moonlight and flame, we could see that Turner was imitated the style of former generation of artists, such as Claude-Joseph Vernet and Philippe Jacques de Loutherbourg. If you carefully enough, you will also delighted to find that in this early oil painting has been appeared signs of “Turner” intense vortex structure. The signs in his later paintings were important elements, such as Storm Seam Boat off a Harbour. The picture is constituted by stroke that is the most basic visual elements in it. No matter it emphasized the perfect composition of the picture itself, or the rich and delicate use in color, the picture should be presented through the painter’s brush traces. With the continuous improvement of language knowledge in painting, the use of stroke caused more attention and discussion. The mastery of strokes has also become an important indicator of whether the painter is mature or not. The stroke has three main roles. The first is the texturing production. Strokes applied directly impact the effect of painting. The characteristics of pigment and diversity of tools and techniques determined the richness of painting stroke and strong expressive in depicting the texture of objects. The reproduction capability of stroke on the texture is an important characteristic, that’s why oil paintings become one of the most expressive forms in painting. The second function is presenting the painter’s idea and the theme of work. The ultimate aim of oil paintings is to express artist’s feels and thoughts, no matter they are figure painting or landscape painting, figurative or abstract painting. In the process of creating, artist employed all elements that can be used to manifest his emotional characteristics to attain the goal of his creation, and strokes just have this capability. Different forms of strokes would bring different psychological feelings, such as circle gives a sense of full, while square gives a sense of stability. In addition, stroke is also the important symbol of the formation of artist’s personal style. From the relation between the characteristics of strokes and painting style, we could see master’s unique and distinct stroke, which formed their unique style of painting to some extent.